Hit the road for a little R & R.
Is your idea of the perfect road trip destination a serene lake with no distractions where you can unwind and enjoy a few hours of solitude? Well, we’ve rounded up a few spots that just might be the perfect destination for you. It’s a bit of a trek from Edmonton to Waterton Lakes National Park – nearly a six-hour drive that almost takes you to the United States border – but it’s worthwhile if only for the stunning views. 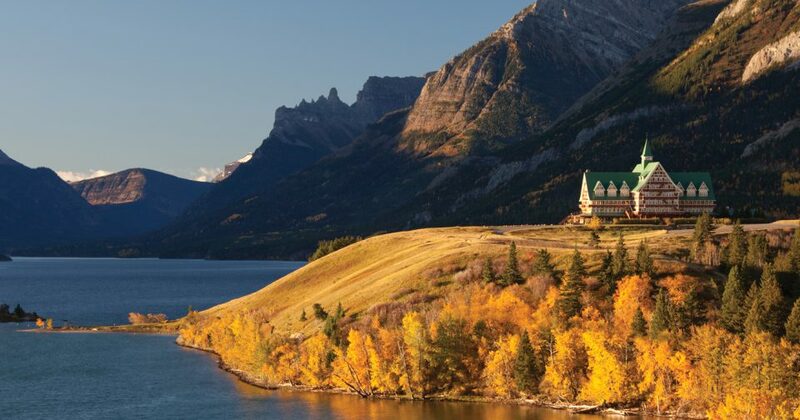 Tip: some of the best views of Waterton Lakes are found at the Prince of Wales Hotel, a grand structure built in the 1920s by the Great Northern Railway and designated a National Historic Site in 1995. When many Edmontonians choose to spend a sunny summer afternoon at the beach, they make the short drive down the Queen Elizabeth II Highway to Pigeon Lake. But, it’s worth staying on the road for just a little longer – becasue of the shallower, warmer water and cleaner beaches at Gull Lake. Just 25 kilometres west of Red Deer is Sylvan Lake Provincial Park, home to some of the most pristine waters and beaches in the province. On the lake, you can fish, swim, water ski, even wind surf, or enjoy plenty of picnic sites and volleyball courts along the beach. If you like your water adventures a little wilder, though, check out the nearby Wild Rapids Waterslide Park, where the twists and turns can thrill both the young and the young at heart.